Copyright 2014 Jamil et al. ; This is an Open Access article distributed under the terms of the Creative Commons Attribution License (http://creativecommons.org/licenses/by/3.0), which permits unrestricted use, distribution, and reproduction in any medium, provided the original work is properly cited. Aims: The objective of the present study was to evaluate the association of oxidative stress markers and antioxidants in gestational diabetes when compared to non-diabetic pregnant women. 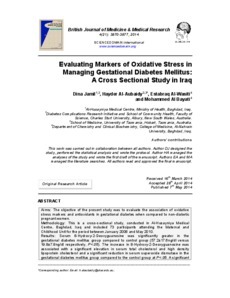 Methodology: This is a cross-sectional study, conducted in Al-Husayniya Medical Centre, Baghdad, Iraq and included 73 participants attending the Maternal and Childhood Unit for the period between January 2008 and May 2010. Results: Serum 8-Hydroxy-2-Deoxyguanosine was significantly greater in the gestational diabetes mellitus group compared to control group (57.2 ± 17.6ng/dl versus 19.8 ± 7.8ng/dl respectively, P < .05). The increase in 8-Hydroxy-2-Deoxyguanosine was associated with a significant elevation in serum total cholesterol and high density lipoprotein cholesterol and a significant reduction in serum superoxide dismutase in the gestational diabetes mellitus group compared to the control group at P < .05. A significant negative correlation was noted between 8-Hydroxy-2-Deoxyguanosine and superoxide dismutase among all the participants included in this study (r = 0.66 at P < .05). Conclusions: The current study proves the importance of measuring markers of oxidative stress (expressed by serum 8-Hydroxy-2-Deoxyguanosine & serum lipids) and antioxidants (expressed by serum superoxide dismutase) in managing cases of gestational diabetes mellitus and provides a useful way of assessing the disease progression and/or remission in response to the treatment.